Restaurant Business Loans – Get Your Restaurant Funding Fast With Excel Capital. Restaurant Business Loans: How To Pick The Best Small Business Loans For Restaurants! As a restaurateur, you know that starting and maintaining a restaurant isn’t easy. Between managing food waste and keeping overhead as low as possible things can happen that may require applying for restaurant business loans. to avoid cash flow problems. It takes hard work, persistence, and a lot of dedication to make your vision a reality, from crafting the menu to deciding on a location, designing the space, hiring personnel, and sourcing ingredients. But it also isn’t cheap. All those ingredients, your staff, and most notably space need to be paid for and that takes funding. Either with your own capital or investment from outside investors. If you’re like most people, you don’t have an extra $275,000 lying around– that’s the median cost of opening a restaurant in the U.S.
That’s why restaurant business loans are so powerful. With a loan, you can generate all the funds your restaurant needs and be off to the races. Or, if you’re a seasoned restaurateur, you can use a restaurant loan to invest in additional hires, a second or new location, or even something as simple as sourcing the ingredients for an updated menu. 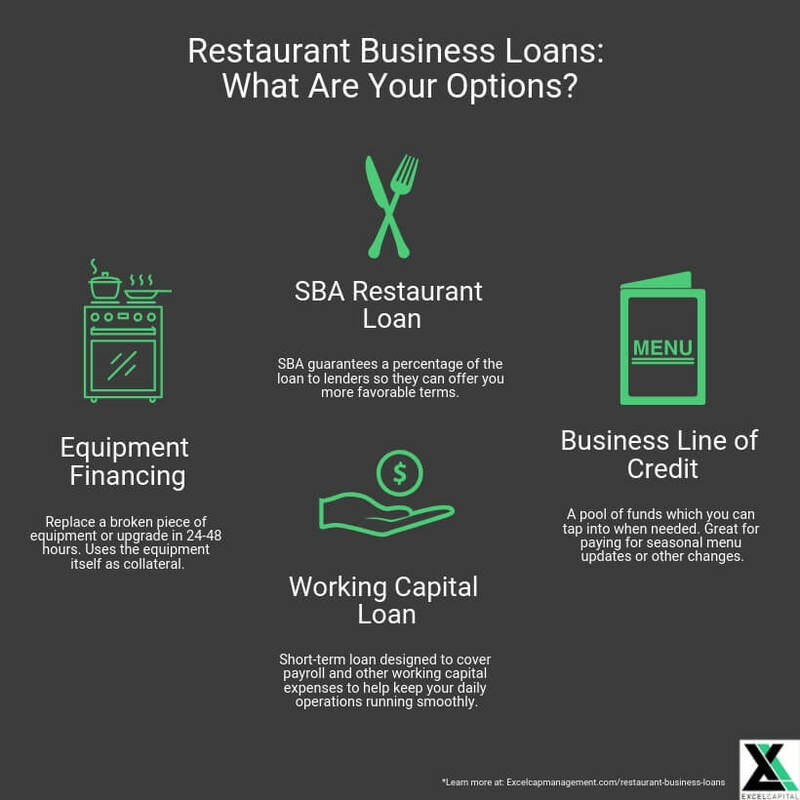 But before we jump into what those options are for your restaurant, let’s break down the average cost of owning a restaurant in more detail and see the various things you can use a restaurant business loan for. Chances are, you already have something you need the funding for in mind. We know it takes a lot to start and run a successful restaurant and much of that can’t operate smoothly without enough capital. So, what can you use a restaurant business loan for? Virtually anything you can imagine needing to pay for to run your business. Renovations: All costs associated with physically setting up your restaurant space from decoration to fixing architectural issues. New equipment: Replacing old or broken equipment. Staff hiring + training: Wages, benefits, uniforms, training and any other costs associated with hiring, maintaining, and preparing your staff. Marketing: Any and all marketing costs including ads, website improvements, and anything else relevant. Working capital: Anything related to the day-to-day costs of running your business. Before applying for a restaurant business loan, it’s important to know exactly what you need the funds for, not just for your own knowledge but so you can be clear with lenders when applying on exactly how much you need to borrow. The clearer you are with your chosen lender, the better they can help you get the funding you need to accomplish your financial goals, so make sure to take the time necessary to get clear exactly how much capital you need. So, you know what you need funding for– whether it’s marketing, new hires, renovation, or a possible expansion to a second location– and you’re clear on how much you’ll need to make it happen. The first place you might think to look would be a traditional lender such as a major bank. However, that’s where many restaurants run into a problem: traditional lenders consider restaurants to be “high risk”. It’s not easy getting approved for a bank loan these days with memory of the real estate collapse of 2008 still fresh in lender’s minds. However, the already difficult process becomes even more so if you’re labeled high-risk, with lenders requiring stricter guidelines for approval when compared to those applying from moderate (normal) risk industries. It leads to a vicious kind of ‘Catch-22’ where restaurants fail often because can’t get the funding they need to succeed without being approved for a loan. But they can’t be approved for a loan because they’re termed high-risk due to their, once again, high rate of failure. If you had been a restaurant 20 years ago, you’d have been out of luck. In the past, obtaining a loan was difficult. Banks were the only available lenders and their credit requirements were (and still are) sky high, in the 660-720+ range. However, over the past decade, the FinTech movement has revolutionized much of the financial industry and turned it on its head. One way that FinTech has changed the way the U.S. financial industry is with alternative lending. There are now many “alternative” lenders who use a broader and more accessible method of qualifying applicants for funding, one which takes into consideration all aspects of your restaurant’s health as opposed to just your personal credit score and yearly revenue. These alternative lenders have opened doors for restaurant owners that many wouldn’t have been able to get through a decade prior, with some loan products that can even be approved on no credit, provided your business is in good standing. According to an old 2003 American Express commercial, 90% of restaurants fail within the first year. Surprisingly, this number has been cited by people everywhere for over a decade with little to nothing to support it. According to a study published by economists Tian Luo and Philip B. Stark that reviewed data from 81,000 restaurants over a 20-year period, that number is much smaller. Unfortunately, no study is going to change how big banks qualify restaurants any time soon. But the data did offer clues that can help you as a restaurant owner place the odds of success in your favor. Interestingly, the same report found that larger restaurant startups have a noticeably higher chance of survival, though they use more capital to make that happen. While the average number of restaurants that failed within the first year was 17%, there was a divide in the data between restaurants with 5 or fewer employees and more than five with an even greater positive difference with those restaurants who had 20 or more employees. The percentage of restaurants with six or more employees that made it past the first year was 1.6 percent higher, while the number of restaurants with 20 or more employees was 2.8 percent higher than that, with the number of restaurants with 5 or fewer employees that survived being just below the 17% average. In addition, larger restaurants were more likely to survive past age 15, with small restaurants of 5 or fewer employees having a 21-percent success rate, medium restaurants of 6-20 employees at 27 percent success, and large restaurants of 20 or more employees having a 33-percent success rate. With the most comprehensive data to date making a compelling case for size being the most significant factor behind restaurant success or failure, the next logical question is: why? With access to the funding they need to service a large staff and execute large marketing budgets, larger restaurants have the ability to maximize revenue. This conclusion is further supported by Luo and Stark’s study. They found that the primary reasons for restaurant survival are primarily funding-related. According to Luo and Stark, restaurants with low earnings and high liabilities are more likely to go out of business. It’s no surprise that a lot goes into launching and maintaining a successful restaurant. However, the data shows that having enough funding to execute a sound marketing strategy, hiring a healthy staff to meet demand, and properly managing finances are some of the most important. With traditional lenders such as big banks being a difficult sell, it’s important to know what your alternative lending options are to help get the funding your restaurant needs. In the next section, we’ll break down what your options are for obtaining funding and which of those options might be best suited for you based on your needs. Restaurant operators as a whole are more optimistic now than they have been in some time. With quick access to small business loans for restaurants now available, restaurant business loans are very easy to qualify for. According to restaurant.org’s annual report, 41% of restaurant operators expect higher sales over the next 6 months, so things are looking up. As a seasoned or budding restaurant owner, you have several diverse options when it comes to obtaining small business loans for restaurants. Deciding which is ideal for you is something only you can do. However, each has its own niche depending on what you need the funding for, how fast you need it, how much you need, and the standing of your business. The most expensive fixed cost of maintaining a restaurant is the equipment cost. When looking to purchase new equipment many restaurant owners don’t have the working capital to buy new equipment or are reluctant to rely on used equipment for the job. Equipment financing helps spread the cash flow burden over terms up to 6 years. If you own a restaurant, you know that broken equipment can be costly. Not only are the high-end stoves and ovens that restaurants use expensive but a critical piece of equipment breaking can mean your kitchen either slows down or is put out of commission, costing you either time or customers– or both. Equipment financing allows you to immediately replace a broken piece of equipment, or upgrade to new state-of-the-art equipment, with little to no hassle. In fact, most lenders can often get you the funds you need within 1-2 business days from approval (and most lenders take just 1-2 days to approve you). Another great thing about equipment financing is it uses the equipment itself as collateral, so you’re not required to put up any business property or personal assets. Learn more about equipment financing. A business line of credit is one of the most valuable types of restaurant business loans as it allows you to gain access to a recurring pool of funds whenever you need it. Equipment breaks down? Use your business line of credit. Have a slow week and need a bit extra for an inventory purchase? Business is picking up and you need to make new hires? Or need adding some seasonal holiday items to your menu and need to update your menus and purchases extra ingredients? A line of credit can cover all of those expenses and more. With a line of credit, you only pay interest on the funds you spend, making it easy to control spending while offering unrivaled flexibility. Learn more about business lines of credit. A working capital loan is essentially a small, short-term loan designed to cover working capital expenses such as payroll and inventory purchases. A working capital loan is useful when you’d prefer to take out a lump sum, or all you need is a one-time loan to cover an irregular expense or activity to keep your daily operations running smoothly. The final option on our list is an SBA restaurant loan, which has two layers of qualification but is offer another valuable avenue to obtain funding. SBA loans are offered in part through the SBA (Small Business Association) and your lender of choice. What’s special about an SBA loan is the fact that the SBA guarantees the repayment of the loan to lenders. Why does that matter to you? Because they guarantee repayment to lenders, those lenders can then turn around and offer more favorable terms to you because of their reduced risk. However, keep in mind that while most or all of the loan products in this section can be approved and funding within a matter of days (often 1-2 days), the unique property of an SBA loan makes it to where it can take between 45-120 days to be approved. Lenders can help speed up that process considerably (in as little as 30 days in most cases), though it still takes much longer for approval when compared to the other loan products on this list. Learn more about SBA loans. Now that you know your options and have begun considering which is best suited to your specific needs, let’s talk about what you can do to prepare and increase your chances of being approved for financing in general. Each loan product is different, including having a different credit requirement and other specific criteria, but there are many things you can do which will improve your chances of being approved (and how much you’re approved for) in general. Your DSCR, or debt-service coverage ratio, is a measure of how much cash you have compared to your debt. Think of it as your capacity to pay off your current debt. Lenders want to see a high DSCR, meaning you have a lot of revenue coming in from your restaurant and very little debt to pay off including bills from vendors and other loans. A DSCR of 1.25 or above is generally what lenders look for. But what exactly does that mean? A DSCR of 1 means you’re breaking even: you have just enough revenue from your restaurant to pay the bills. For example, if your monthly revenue is $50,000 and your expenses are $50,000, your DSCR is 1. A DSCR of 1.25 means your revenue is 125% of your debt. For example, if your monthly revenue is $100,000 but your monthly recurring debt is just $80,000, you’d have a DSCR of 1.25. If you’re worried about these numbers, don’t be. While it’s true that restaurants typically have a very low profit margin, 2-6% according to the National Restaurant Association’s Restaurant Operations Report, there are other areas you can make up ground on your application. In addition to this, take some time to see if there are any ways you can widen that margin first before applying. It will not only give you a better DSCR but improve your profit margins. With alternative lenders, a good DSCR can even help counterbalance a low credit score, so it’s one of the most important metrics to consider when applying for financing. What does my credit report look like? If you’re applying for a loan, it’s critical to take some time to review your credit report. Credit will hold a different weight depending on whether you apply for a traditional bank loan or through an alternative lender. However, credit plays a part in virtually all types of lending, so you’ll want to make sure you have your things in order before applying. This is particularly important because most people have items on their credit report which either can be removed (such as old credit accounts) with a simple letter or liens or judgments that they weren’t aware of which can often be taken care of quickly and removed from your credit report promptly. Some items which hold weight can’t be so easily removed. However, many can and every little bit counts. Most credit items won’t deny you with alternative lenders but they will affect how much you’re approved for, so they’re still worth looking over no matter what route you decide to take. Next, let’s talk about some important questions to ask yourself before applying. 1. Why do I need a restaurant business loan? We touched on this earlier but it’s important to take the time to figure out exactly what you’ll be using the funds from a loan for. If you don’t have a rough estimate going into this or could end up misusing the funds when you receive them or receive less than you needed. 2. When do I need it? This is a subpoint to the first question, and likely irrelevant to most, but it’s important to consider because some loans don’t offer quick approval. For example, most loan products with newer alternative lenders are very fast, 1-2 days in most cases. However, traditional bank loans can take weeks, if not months, to process and SBA loans no matter you who you get them through can take 30+ days. Because of that, it’s important to know in advance how quickly you’ll need the funding (especially if it’s for an impending busy season) so that you choose a loan product which fits that time frame and can have the funds in your account exactly when you need it. 3. Have I reviewed all of my options for restaurant business loans? Now that you’re in the search phase, make sure you review all of your possible options. Have you researched each of the different types of loans that could serve your need? Do you know the pros and cons? And have you researched lenders to find the one that has the most favorable terms based on these preferences? Each of these is sub-questions you should be answering that have to do with making sure you’re obtaining the terms that are most suitable to you and your situation. The last thing you want is to go forward with something before you fully understand what you’re getting yourself into. 4. Am I ready to apply? Once you’ve reviewed all of your options, you need to ask yourself if you’re truly ready to apply. Have you double checked your credit report? Business numbers? Cleaned up and dotted everything you could? These little steps might seem like a drag but they can make a big difference in your chances of approval and increase the amount you’re approved for. And, finally, let’s finish this section by flipping the conversation to the kinds of questions that lenders might ask while reviewing your application. This is important to consider because it allows you to put yourself in the lender’s shoes and potentially notice things you can improve that you hadn’t noticed yet. When lenders review your application, they’ll be looking for certain things. We’ve touched on several of those factors so far. However, there are many more. The questions below organize each of these factors into three convenient questions that allow you to “peer into the mind” of the lender and get a better idea of what they may be looking for and what you can do to maximize your approval odds and amount. What kind of business do you own and how old is it? It’s one of the more basic lending requirements, however, requiring 6 months to 2 years of business history (depending on the lender) is universal among lenders. Lenders want to see that you’ve been around for a while and have proven yourself. If you’re just starting your business you have no track record. Therefore, lenders have no way of knowing if you can be counted on. In addition to this, depending on the type of loan and who you get it with, a varying amount of information about what type of business will be required. This is important to know because you may need to “pitch” the value and uniqueness of your restaurant. This is where credit comes in. Lenders next want to know how responsible a borrower you are. In other words, how much can they trust you? In reality, that’s what your credit history is telling them. As an important note, it’s your personal credit that will be weighed primarily in any business loan decision, not your business credit. However, that can play a role as well. In the past, this was everything. Traditional bank loans required stellar credit and valued other metrics very little by comparison. However, now alternative lenders offer a more balanced approach that takes several other metrics into consideration more equally (such as DSCR), placing less pressure on you to have great credit. Having said that, it’s still an important metric you should have as polished as possible before applying to any restaurant business loan. How effectively do you manage your money? How much cash you have on hand relative to your revenue? And do you pay on time? When applying, lenders will request all kinds of different paperwork to verify the numbers you put down in your application (more on that in a moment). If you’re really good here but not so good in the credit department, this can offset that greatly. Now that you have your things in order and are ready to apply, let’s review the documents you’ll want to have gathered before submitting your application. This is important because lenders will often request various documents for verification, or simply more information, after submitting your application. Depending on the lender, how much you’re requesting, and why you need the funds, you may need several types of documentation. Keep in mind that it all depends on the type of loan product and lender as to what documents will be requested. However, it’s smart to have as many of these documents on hand so you’re ready when it comes time to apply. You now know your options, have reviewed your own numbers to determine how much funding you need, and have taken steps to prepare yourself for applying for restaurant business loans and maximize your chance of approval. Now, all that’s left to do is apply. Provided you’re approved, you’ll now have the funds you need to get things moving, whether that’s opening your first location, your fifth, or investing in renovations.